Visit the Rest of The PPDRDG by Returning to the Site Map and Picking Another Page! 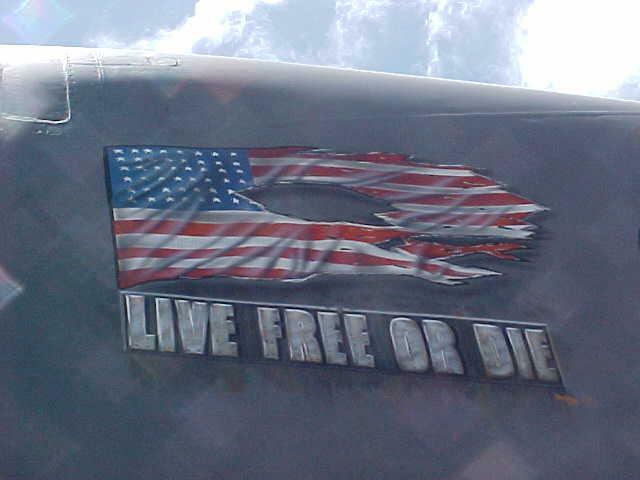 Rockwell B-1B, 86-0114; Nose Art - "Live Free or Die"
366th Wing, 34th Bomb Squadron "Thunderbirds", Mountain Home AFB, Idaho. Crew members from both the 366th and the 28th Bomb Wing, Ellsworth AFB, South Dakota were aboard. At about 2130 hours DGAR time, December 12, 2001, a B-1B, Capt. William Steele, Aircraft Commander, crashed off Diego Garcia. The aircraft became uncontrollable after multiple malfunctions, and the crew ejected while the aircraft was inverted at about 15,000 feet. All four aircrew members were rescued by the crew of the DDG 59, the USS RUSSELL. The RUSSELL's Captain, CDR Hank Miranda, launched RHIBs, with LT Dan Manetzke, the ship's weapons officer, as boat commander for the rescue. A Navy P-3C Orion Maritime Patrol Aircraft from Patrol Squadron Four (VP-4) from Kaneohe Bay, and an Air Force KC-10 tanker from the 60th Air Mobility Wing at Travis AFB flew top cover. For official news on the crash, with photos, go to PACAF News or PACFLT News. AP writer Robert Burn's Article. LT(jg) David Hardy's letter home recounting the crash. Taylor: Good afternoon. We have on the phone with us, from aboard the USS Russell, near Diego Garcia, three people: Captain William Steele -- that's all "E's" -- S-T-E-E-L-E, who was the mission commander of the B-1. We have Commander Hank Miranda -- M-I-R-A-N-D-A -- who is the commanding officer of USS Russell. And we have Lieutenant Dan Manetzke, who was the officer in charge of a small boat that actually went from the ship to pick up the B-1 crew. We may be joined in progress, as they say, by a representative from the KC-10, the Air Force aircraft that orbited overhead as some of these events were transpiring. Taylor: Captain Steele is the mission commander, yeah. Q: Is he also the pilot? Taylor: Captain Steele, are you also the pilot? Taylor: Okay. We're going to have -- I'm going to ask them to make brief statements. First, Captain Steele from the aircraft, then Commander Miranda, then Lieutenant Manetzke. Then, after they make their statements -- I've just asked them to tell a little bit about what they did, what they saw, what they felt, that sort of thing. Then -- we'll do all three of those statements, and then there'll be an opportunity for you to ask some questions. And I'd like to remind each of you to wait for the microphone, and also to identify yourselves when you ask the question, and if it's for a particular person, that you address it accordingly. Now, I'm told the ship is right outside the harbor at Diego Garcia, and they'd like to get on with their business, so I promised that we'll move through this smartly. So first up, Captain Steele, mission commander of the B-1. Steele: Well first off, I'd like to say I'm thankful that the entire aircrew got out safely, are all doing well. Next, I'd like to thank the aircrew of the KC-10 that helped recover us safely and the crew of the USS Russell. You did an outstanding job, everybody. Taylor: Captain Steele, sir, can you speak a little more slowly? Steele: We just want to be sure we can hear you clearly. Steele: Okay. Do you need me to repeat what I just said? Taylor: Yes, that's much better right now. Thank you. Please repeat what you just said. First, I'm thankful that the entire aircrew was able to bail out safely. We're all doing very well. I'm also thankful for the KC-10 aircrew, who did an outstanding job helping to get us recovered quickly, and the crew of the USS Russell. Everybody did an outstanding job. It was by the book. Miranda: Yes, Commander Miranda here. I just wanted to say that the crew of USS Russell did everything by the book. We were here on our deployment mission. And when we heard that the aircraft was missing, we did all the proper procedures and went to the area that we thought it would be -- around the area that we thought it would be located. And we had our boat to the water as soon as possible. We made best speeds to the location and we picked up the pilots. Like Captain Steele said, everything worked like clockwork. It was a very good team effort by the Air Force and the USS Russell here in this very remote area. And we're very thankful that the crew is all safe. That completes my statement. Taylor: For those of us in the room here, there's a little bit of a lag. We have to be careful to wait in between speakers. Manetzke: Lieutenant Dan Manetzke here. Just to echo what the captain said, it was professionally -- the whole situation was taken care of very professionally. The crew is trained to respond at quick notice when something like this happens. It was great to get in the rig and proceed out to the site and find all four pilots alive and well. Everybody did their job by the book. That's the end of my statement. Taylor: Okay. Has the KC-10 joined us? KC-10? No. New airplane. No? Okay. First question from -- well just identify yourself, please. Q: This is Bob Burns from Associated Press. I have a question for -- a couple questions for Captain Steele, if you would. Could you tell us, for starters, were you en route to Afghanistan, and did you manage to release your bombs after you declared the emergency? And can you tell us what the emergency was? Steele: All I can say is I was flying a normally-scheduled mission in support of Operation Enduring Freedom. And as far as the aircraft malfunctions, we had multiple malfunctions. The aircraft was out of control, and we all had to eject. Taylor: One second. I think the -- Captain Steele, I think the first part of what you said did not come through very clearly. If you could -- I apologize, but if you could say that over again and try to speak slowly and maybe directly into -- more directly into the handset, please, sir. Steele: Okay. As far as our mission, it was a normal, scheduled mission in support of Operation Enduring Freedom. I don't think I'm at liberty to say whether we were coming or going from Afghanistan. The cause for our airmen to eject was multiple aircraft malfunctions which rendered the aircraft uncontrollable, so we all had to eject. Q: This is Jim Garamone from American Forces Press Service. When you ejected, did any of your crew suffer any kind of injuries at all? Steele: Yes. Minor injuries. I will say that going through an ejection like that is about the most violent thing I've ever felt. We're all pretty bruised up and have some cuts, but overall we're doing very well. Q: This is Pam Hess with United Press International. Could you tell us how soon after you took off that you experienced this malfunction and how long you spent in the water? And how did you communicate with the KC-10 or the ship your location? Steele: Well, I'm not going to discuss any mission-related information. I will say we were in the water for approximately two hours. And far as communicating with the KC-10 and the ship, we all carry our survival vests and a seat kit, which contains radios and several marking devices, so that everybody can see us. Q: Captain Steele, this is Barbara Starr with ABC News. Can you describe for us just a little bit more what you mean by the aircraft being out of control? How did the malfunction emerge, and what portions of the aircraft were out of control? For example, did you start to spin, or what exactly happened? Steele: I'm sorry. I'm not going to go into great detail on that. Basically, we had multiple aircraft system malfunctions, which made it impossible for us to fly the aircraft. Q: Captain, this is Bruce Rolfton from Air Force Times. Two questions: How long was it between the time you declared the in-flight emergency to the time you ejected, and then, could you describe the ejection process, and once you were in the water, how far the four crew members were apart? Thank you. Steele: We had declared the emergency about 15 minutes prior to us having to eject. The ejection sequence worked very well in the B-1. Each crewmember sits on an Aces-II ejection seat, which is the best in the world. But several five-second events have to go on to get us out of the aircraft; hatches have to go off the aircraft, and eventually, our seat fires, and we exit the aircraft. And basically, once you pull the ejection handles, everything is automatic: I'm ejected out of the aircraft, my parachute opens automatically, my seat kit deploys with my life raft. So everything worked as it should have for me. Q: Captain, this is Steve Vogel with the Washington Post. After you declared the emergency, you had turned the aircraft around. And were you trying to do an emergency landing at Diego Garcia? And also, could you describe the situation in the water? Were there any dangers immediately present, any sharks or anything that that you were aware of? Steele: We were attempting to land at Diego Garcia. In the water, no, we didn't see any hazards, no sharks or anything like that that we saw. Actually, it was kind of comfortable. It was nice warm water. Let me go back to a question that was asked earlier on. We were separated far enough that I could only see one other of the crew members. I was able to link up with one, and he was the only one that I saw until we were all picked up. And, well, I was thankful to see everybody did get picked up. Q: Can you tell us from what altitude you ejected? And how long did it take to hit the water? Q: Yeah. This is for Commander Miranda. Were there any particular challenges that the Russell faced in either getting to the site or coordinating the rescue effort? Could you describe that a little bit for us, just exactly how all of that worked? Miranda: Yeah. As soon as we lost radar contact with the aircraft we immediately went to the aircraft that were in the area at the time to try to locate -- to see if there was any life that they could see. The area that they are -- went down in was a particularly shallow area. And we had to navigate very carefully. We brought the ship as close as possible to where we thought the aircraft or the downed pilots were. And we had to put our boats in the water to actually make the recovery about seven miles away from the ship. So that was the big challenge there, was the particular spot where the pilots went down. Q: This is Jim Mannion from AFP. It's a question for both Captain Steele and Lieutenant Manetzke. First of all, Lieutenant, when you actually pulled these people out of the water, what was their reaction? What did they say to you? I mean, were they -- did they say anything at all? Were they cheering, whatever? And basically the same question to Captain Steele. Manetzke: It's Lieutenant Dan Manetzke. When we arrived on the scene and met up with the pilot, our first response, obviously, was to make voice contact with them and make sure that they're okay medically, and everything looked good there. You know, we needed to get them in the small boat -- gathered up and in the small boat. Basically, I think they were just as happy to see us as we were to see them. I don't think we said too much. We shook hands with the crew members on the boat. And we're all professionals here, so we just didn't have much to say besides big smiles, "thank you," and shake a hand. Q: This is for Captain Steele. Toby Zakaria with Reuters. Were any of the multiple malfunctions on the bomber caused by enemy fire of any kind? Steele: No, they were not. Q: This is Sandra Jontz with "Stars and Stripes." Captain Steele, how soon will you and your crew get back to work? Steele: Right now I'm pretty sore, and I'm not sure how long the Air Force is going to keep me down. But I'm ready to fly as soon as I'm able. Q: This is for Captain Steele. Have you flown missions into Afghanistan before? I'm guessing this was not your first mission. And for the Navy folks, could you describe what you saw of the plane wreckage? Was it in pieces or was it in a large piece or was it sunk? Steele: This is Captain Steele. Yes, I've flown several missions into Afghanistan before. This is not my first. Manetzke: This is Lieutenant Manetzke. It was dark. It was about 1:00 or 2:00 in the morning here when all this took place. And we saw no wreckage or anything like that in the water. Q: Captain Steve (sic) -- Captain Steele, this is Steve Vogel with the Washington Post again. How has the B-1B been holding up during the Operation Enduring Freedom? Have you experienced many maintenance problems with the aircraft, or have they been flying pretty well? Steele: The B-1 has been doing outstanding since we've been here. We have a very high mission-capable rate and very few systems malfunctions. It's an outstanding aircraft; just sometimes things go wrong. Q: Commander Miranda, what was the USS Russell doing at the time this emergency came in? I don't know if you were there permanently as a search-and-rescue capability or you had other business in the area. Thank you. Miranda: Our mission in the area was to monitor aircraft coming in and out of Diego Garcia, and also to provide any assistance for any aircraft in the area. Q: Captain Steele, this is Bob Burns from AP. Are you and the other crew members from the 28th Bomb Wing at Ellsworth, or could you tell us where you're based? Steele: Yeah. Two of us are from the 28th Bomb Wing at Ellsworth, and the other two are from Mountain Home Air Force Base in Idaho. Q: We heard you just say two from Ellsworth and two from Mountain Home? Q: This is for Captain Steele. This is Tony Capaccio with Bloomberg News. Can you give us a sense of how the crew felt as you felt the plane go out of control, you had to parachute and hit the water? Was there any panic, distress, or how did you feel? Steele: I actually wasn't scared at the time. I was just trying to go through all the emergency procedures that I could and then do my ejection sequence properly. I wasn't scared until I was actually in the chute on my way down, because at the time of the accident, I was just trying my best to save the aircraft and the aircrew and do my job. Q: Captain Steele, this is Jim Garamone again. Have you been able to tell your families you're all right? Steele: I have not yet been able to. I understand they are being called, though, by the Air Force. Q: Chris Wright from Fox News Channel, for Captain Steele. Can you tell us about the actual ejection? Do you all eject at the same time, all four of you? And what did it feel like? What was the attitude of the aircraft when you punched out? Steele: The way the B-1 ejection system works, you don't exactly go out all at the same time. It's sequenced to avoid interactions between hatches and seats and everything. However, it is very -- it reacts very quickly, and you get all four crew members out in just a matter of seconds. As far as anything relating to the mishap there and the attitude of the aircraft, I'm not going to speak of at this time. Taylor: Okay. I'm told now that we have also on the phone Major Brandon Nugent, who is the mission commander of the KC-10. Sir, first, if I don't have your name right, please correct it. And then, sir, if you could, please just tell us a little bit about what you heard and what you saw and what you did today. Nugent: Okay. You got my name right, and we were taking off on a completely unrelated mission. As we were proceeding out, we heard the aircraft in distress returning to land, and we knew that they had a problem. The last thing we heard was that they were going to circle over the field and burn down some fuel. We didn't hear from them for a few minutes after that, and then we started picking up a emergency locator transmitter. We reported that, and after it was determined that they were out of radio contact, we then proceeded to the last known coordinates of the aircraft and started to search for them. I would like to just say that my crew was outstanding. Captain Dali was the other pilot on board, and he has extensive training in search and rescue from previous aircraft experience. And Sergeants Bero and Huhn were also very instrumental in locating the actual flares and the beacons and the strobe lights that were in the water. Once we did start locating them, Captain Dali was outstanding on the radios, coordinating with them and calling in all the rescue other aircraft and also the ships that came and actually picked up the downed crew. Taylor: Sir, it's Captain Taylor again. Could you please spell your last name, and also spell the name of the captain that you mentioned a couple of times? Nugent: My last name is Nugent. It's N-U-G-E-N-T. And the captain is Mike Dali. It's D-A-L-I. Taylor: Yeah. I'm sorry? And to spell out the names of the two other folks that you mentioned, please? Nugent: Okay. Our flight engineer was Master Sergeant Lori Bero. And her last name is B-E-R-O. And our boom operator was Tech Sergeant Joe Huhn, which is H-U-H-N.
Taylor: And can you spell Lori's first name, please? Taylor: Okay, now we're done with spelling. Sorry to drag you through that one. You have some questions here. Just one second, please. Q: Did you happen to see any of the wreckage of the B-1 bomber? Nugent: No, we did not. From the altitude and the time of night that it was, all we could see were either the flares or the signalling strobes in the water. Q: Can you please tell us how long it took when you began to search for the crew members and when you found them, and then what that was like, until you spotted them, if there was any tension of any kind? Nugent: I think I can speak for all of us. There was extreme tension. We had about -- it was about 20-25 minutes from the time that we started turning back towards the last known position until we actually got over the position. Then we started to circle that area, and once we saw the flare -- actually it was Sgt. Huhn who saw the flare in the water. The pilot in the water apparently saw our lights and shot a flare. And when we saw that, we were extremely excited about that. And then shortly thereafter Captain Dali was able to establish radio contact with the co-pilot of the downed aircraft. Q: Can you remember the words that were exchanged, those first words between Captain Dali and the people in the water? Nugent: This is Mike Dali right here. I think he'd be better to answer that question. Dali: This is Captain Dali. The first that we did was obviously establish who it was, and then we have a certain code. We determined which crew member it was, it happened to be the co-pilot from the B-1. And the first thing that I wanted to know, being a former rescue guy, was what his condition was as far as his physical condition and what kind of signalling devices he had. So we kind of had a conversation regarding what his health was, and it happened to be good with just a small laceration to the face. And our next bit of conversation was how are we going to find you in the middle of the ocean with the rescue ship? Unfortunately, he had lost some of his equipment in the ejection, but he had one flare left. And we established an orbit over the top of him at that point and stayed in constant communication. And once the boats got close enough, we had him pop that flare, and the boat zoomed right in on him. Q: This is Jim Mannion from AFP. This may be a question more for the commander of the B-1. A couple of times it's been mentioned that you were trying to land. And what I'm trying to figure out is whether you were trying to land after declaring an emergency, whether you were trying to get back to the airport, or whether this incident occurred as you were trying to land, returning from a mission. Steele: I'm sorry; I'm not going to answer exactly what part of the mission that occurred on. I will say we were attempting to land at Diego Garcia. Q: This is a question for the KC-10 crew members: First, Captain Dali, what was your background in search-and-rescue? I don't know if you were of the HC-130s. And also, for the KC-10 crew, what is your home base or unit? Thank you. Dali: Okay, this is Captain Dali. I'll answer the first one. I was an HH-60 pilot, an Air Force rescue pilot. We did fly in conjunction with the HC-130s, but my primary job was long-range, over-water rescue, which happened to work out nice. The KC-10 crew is from the 79th Air Refueling Squadron, based at Travis Air Force Base in California. Q: And this is a question for Captain Steele. This is Thelma Labreque with AP Radio. You had mentioned that you were not frightened until your parachute was going down. Could you explain what was going through your mind at that time, just to give people a little bit of a sense of what you were feeling -- what was your reaction, what was going through your mind, what happened when you hit the water, what were the other crew members doing? Give us a little bit of a personal sense of what was going on there. Steele: Well, it didn't really hit me what happened until I was already under my parachute. At that point, my mind was racing, and really trying to go through all my procedures to prepare to land the parachute and prepare for my recovery. It is a very scary -- very scary to eject from an aircraft, I'll say that. So I had a lot of adrenaline going. But as soon as I got over that, it was right back to trying to remember my training and do all my procedures correctly. As far as what the other aircrew members were doing, I'm not certain, because they were fairly spread out, except for I was able to link up with my OSO [offensive systems operator]. And we were just working together, trying to work our radio procedures out and mark our positions for everybody coming to recover us. And one thing I should have mentioned earlier -- it's kind of a rough night -- we also had a Navy P-3 out there assisting with our recovery. It was flying at a low altitude, searching for us with a spotlight. And I know they did a great job, too, finding us and helping to direct our recovery. Taylor: Maybe one or two more questions. Maybe you two. Q: We heard how the first co-pilot got plucked out of the water with a flare. How did the other three get located? Steele: Who was the question directed to? Taylor: Whoever can answer that question. Manetzke: Lieutenant Manetzke here. Basically, as we said earlier, the ship was only within five to six miles of the spot. We put our small boats in the water. We had a bearing and range from the ship, which we geared the small boats on. And we were watching the P- 3 fly overhead with a spotlight, so we kind of -- we used that as a beacon when we first got in the water and drove to that area. As we approached the area, we picked up the pilot's light beacon about 1,500 yards or so from where we arrived. We saw two of them -- obviously the two pilots were linked up together, and then the one off to the side. Recovered those three guys. And then, as we were making our approach back to the ship with those three pilots, the fourth pilot shot his flare and we were able to maneuver over to his position and pick him up as well. Q: Captain Steele, Jason Ryan from ABC News. Can you just give us the names of the three other crew members who were with you on the B-1? Steele: I would rather not release their names at this time. I don't know what their personal preferences are as far as having their names released right now. I will give you their call signs. The other pilot flying with me, call sign is "Rooster;" the offensive systems operator -- call sign "IROC;" and the defensive systems operator, call sign "Lost." Taylor: Perhaps you could repeat the call signs one more time for us, please. Steele: Okay. The other pilot's call sign is Rooster. The OSO's is IROC, and the DSO's is Lost. Taylor: Okay. On the last two, perhaps you could spell them for us. Steele: Okay. I'll spell it phonetically. The OSO's call sign is India-Romeo-Oscar-Charlie. DSO -- call sign, Lost -- Lima- Oscar-Sierra-Tango. Taylor: Okay. For the -- I heard, "Lost. Lima-Oscar-Sierra-Tango." For the other one, I heard, "India-Romeo-Oscar-Quebec"? Taylor: Charlie. Okay. All right. Lost. Okay. Gentlemen, thank you very much for your time. I know it's been a challenging, exciting, big day. And congratulations to everyone involved. Thank you very much. We watched on radar and talked on radio to this B-1 that left Diego Garcia around 2100 hours last night. At about 100 nautical miles out, they called in an emergency. One of their engines was out and they couldn't get it going again. They turned around and started heading back, stating that they were okay and that they would get back to D.G. and fly around the island a little to burn off extra, then land. They didn't make it back. Shortly after the u-turn, they disappeared from our scopes without a trace. It's close to 2200 when this goes down and the Captain gets on the announcing system to tell us what happened. We head straight for their last position at over 30 knots. On our way there, we started preparing for the worst. We manned up our two RHIB's (rigid hulled inflatable boats) with a whole bunch of guys and gear. We had night vision gear, blankets, first aid, stretchers, Gatorade (they were pretty happy about the Gatorade), and a whole bunch of other stuff. Each boat had a corpsman (for medical help), signalman (in case the radios died), engineer (to fix the boat), officer (to be in charge), coxswain (he drives the RHIB), a seaman (to do anything the coxswain says), and a rescue swimmer to bring the pilots out of the water. Onboard the ship, they are preparing stretchers and stretcher bearers. All sorts of lookouts are being manned. It was a pretty hectic transit. So the CO gets on the announcing system again, and tells us what he knows. "A B-1 went down. They have a crew of four. We are talking to one of the pilots on his rescue radio. He is in his life raft and doing okay. He can hear voices around him. Where they are is a shallow area that the ship can't get to. We are going to stop about 5 - 10 miles away and send the RHIB's down the bearing to the pilots." Just when we stop and begin to put the RHIB's in the water, he gets on again. "Two pilots are now together and in their rafts and doing okay. They can hear voices around them still." So I'm now thinking that all four are accounted for and alive and talking. This is good. We dropped the RHIB's into the water. Mine went in second. Then, it didn't start... but that's what the engineer is for. It only took a few minutes to discover a loose cable on the battery. We got going a mile or two behind the other RHIB. On our way out, we could smell all of the jet fuel. All I was thinking was that I hope I don't have to swim in it. After about 7 miles, the other RHIB said that they had found the two that were talking on the radio. We slowed down a bit and begin to close in on their location. We were looking all around. So were the planes. There were three planes all doing low flying runs this way and that with their landing lights on. It was kind of wild. As I watched the water that one was lighting up I saw a flash. As the plane flew by and the area darkened, it was easy to see a strobe light not too far from us. We jammed straight for it. When we got closer and slowed down, we saw that it was indeed a pilot. He said that he was okay, so we just leaned over and pulled him in. The ejection process is a pretty violent evolution. He had 'rope burns' on his arm and neck and face from various straps and stuff pulling tight when the chute opened. He was pretty stiff and sore, too. Also, he didn't have his raft. It was torn away from him at some point before he got to the water. At this point we were told to transfer our guy to the other RHIB with the two guys in it. Then, they were going to take them back and we would stay and look for the fourth. As we were about to start over to meet the other RHIB, we saw a flare. All three pilots said, don't worry about us, lets go get our buddy. So, both boats headed straight for him. We got there about the same time as the other one. We decided that we'd pick him up to even out the loads in the RHIB. I actually got to get into the water for this one. The guy was in his raft and we didn't want to get too close because we might foul our prop on his parachute or sea anchor. I jumped in and swam up to him. "Good evening, my name is Jim and I'll be your Rescue Swimmer for the evening." It got me a smile and a chuckle - this guy is okay, too. He asked me what the drill is to get him out of the raft and into the RHIB. I tell him that he rolls out and i give him my floatation device. Roger that. He rolls out and grabs the SAR-1 (floatation device), I grab him, and we kick over to the boat. They lifted him into the RHIB and we were on our way. Mission complete, job well done. Anyhow, the CO gave us a holiday routine today, so I am going back to bed. 1. I CANNOT EXPRESS MY APPRECIATION ENOUGH FOR THE SUPERB PERFORMANCE OF THE US NAVY IN THE RECOVERY OF THE CREWMEMBERS OF ICECUBE 44. THE IMMEDIATE RESPONSE OF BOTH SURFACE AND PATRON UNITS; THE COORDINATION WITH THE AIR FORCE IN THE AIR AND AT DGAR; THE TURN-TO SPIRIT OF ALL THE NAVY IN RECOVERING OUR AIRMEN WAS A WONDER TO BEHOLD. 2. SPECIAL MENTION MUST GO TO THE CREW OF USS RUSSELL. FROM THE RESPONSE TO THE INITIAL MAYDAY TO THE LOCALIZATION EFFORTS TO THE SUCCESSFUL RECOVERY OF THE AIRMEN, THE RUSSELL PERFORMED WITH UNPARALLELED PROFESSIONALISM. THERE CAN BE NO GREATER SIGHT TO AN AIRMAN IN THE WATER THAN THE RHIB CLOSING HIS POSITION. 3. THE RECOVERY OF THE B-1 CREW TOOK JUST OVER TWO HOURS. UNDER ANY CIRCUMSTANCES THAT IS QUITE A FEAT. ON A DARK NIGHT IN THE MIDDLE OF THE INDIAN OCEAN, IT IS REMARKABLE. THIS HIGHLIGHTS THE JOINT TEAM LIKE NOTHING ELSE....IT DOESN'T GET MUCH BETTER THAN THIS. 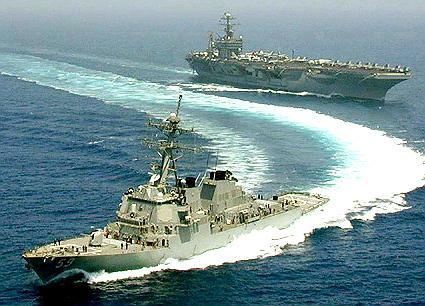 CFACC SENDS HIS PERSONAL THANKS TO THE MEN AND WOMEN OF THE US NAVY. RMKS/1. PLEASE CONVEY MY PERSONAL CONGRATULATIONS TO ALCON FOR A JOB WELL DONE. YOUR PROFESSIONALISM, TIMELY EFFORTS, AND RESOURCEFULNESS MADE THE SEARCH AND RESCUE OF THE DOWNED USAF B-1 BOMBER CREW A COMPLETE SUCCESS. EACH INDIVIDUAL INVOLVED IN THIS RECOVERY OPERATION CAN BE JUSTIFIABLY PROUD OF THIS ACCOMPLISHMENT. 2. YOUR RESCUE ACTION WAS LEAD NEWS ON ALL NETWORKS THROUGHOUT THE DAY AND I WATCHED WITH GREAT PRIDE. YOU ASSURED THE NATION TODAY THAT WHEN FELLOW SERVICEMEN ARE IN DANGER, RESCUE ACTIONS ARE SWIFT AND PROFESSIONAL. This, and everything else I write and every photo I produce is copyrighted by Ted A. Morris, Jr.